Organised by the Igor Zabel Association for Culture and Theory in cooperation with the Moderna galerija and SCCA-Ljubljana, Centre for Contemporary Arts – World of Art Programme and with support of the ERSTE Foundation. The World of Art School and Igor Zabel Association for Culture and Theory are presenting the new series of public lectures entitled Reflections and shifts in curatorial, critical and artistic practices. The World of Art School is continuing to feature international and Slovenian protagonists who present individual and collective strategies and tactics applied in their curatorial, critical and artistic practices, seeking to establish unique ways of operating within the established art system. In a series of lectures, they are presenting their views and experiences, thematising their concepts and projects. We expect this year to be especially interesting since we are preparing a series of lectures in a slightly changed format and in collaboration with Igor Zabel Association for Culture and Theory. As one of the most prominent curators, thinkers and theorists in Slovene cultural milieu, Igor Zabel has been involved in the programme of the World of Art School on different levels from the very beginning (as a tutor, lecturer, and consultant). 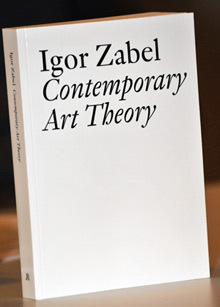 This is also a reason for us to begin our collaboration and announce this year’s series of lectures with a public presentation of Igor Zabel: Contemporary Art Theory. Speakers: Urška Jurman, programme manager of the Igor Zabel Association and Zoja Skušek, co-editor of the selection of texts for the Igor Zabel: Contemporary Art Theory and editor of the Slovene editions of Igor Zabel’s texts Eseji I – III, published by Založba/*cf between 2006 and 2010.